As cooler weather approaches, it is time to have your fire pit ready to enjoy at a moment’s notice. Not only will these few tips clean up the appearance of your fire pit but it will also make it safer and more enjoyable. 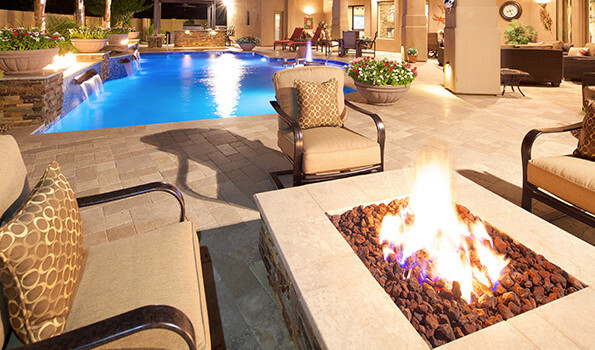 Most homeowners choose gas fire pits because of their ease of use and relatively low maintenance. There is no need to shovel out ash and clean out the fire pit on a regular basis. The most important reason to clean gas pits is the visual enjoyment. If the pit is made of stucco, stone or brick on the outside, dirt and dust can be removed by gently spraying the exterior with your garden hose. If there are persistent stains or soiled areas, use a very soft scrub brush and gently scrub the surface while spraying with the garden hose. Be sure to allow 48 to 72 hours for the fire pit to dry before using it. Wood burning fire pits do require more regular maintenance to remain safe and functional. The exterior of a stucco, stone or brick wood burning pit can be cleaned in the same manner as the exterior of a gas pit. The inside of a wood burning fire pit is going to need to have the ash removed after each use. Once the ash is completely cool, scoop it out with a small metal shovel or scoop. Larger embers can hold heat for several days in some conditions so a metal implement is always a good idea. It is also best to place the ash in a metal ash can to be certain that it is completely cooled before placing it in a trashcan. If there is a thick residue buildup on the inside of your fire pit, it can be cleaned with a mixture of one part muriatic acid to nine parts water. Use a soft scrub brush to clean the interior and then rinse with clean water. Always allow 48 to 72 hours for the fire pit to dry before the next use. A drastic change in temperature can cause masonry landscape features to crack. When lighting a wood burning fire pit, allow the wood to catch slowly and avoid using accelerants such as lighter fluid which can heat up the masonry feature too quickly and cause cracking. With a gas fire pit, use the ignitor to light the gas and keep the flame reasonably low until the stonework begins to heat up. When extinguishing the gas fire pits, simply turn off the gas and remember that even after the flame is gone, the glass or rock fill, as well as the pit itself, can remain hot to the touch. It is always best to allow a wood burning fire pit to burn out naturally. Never dump water on the fire or on the embers to extinguish the fire if at all possible. This is not only dangerous as it could cause the fire to pop and throw hot embers but it can also damage the pit by cooling areas too quickly and causing cracks. Starting the fall with a clean fire pit will allow you to enjoy it whenever you have the time on a chilly evening without the worry of causing damage to an uncleaned pit or creating a fire hazard due to residue buildup. 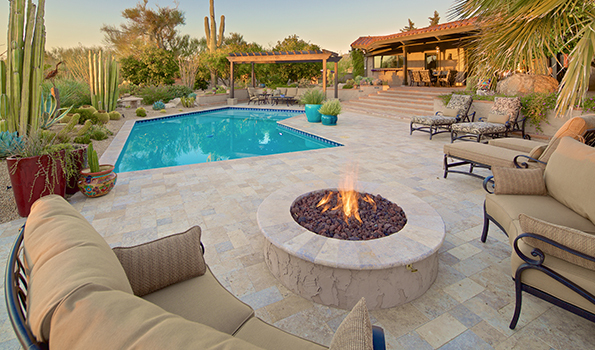 Fire pits are a very popular feature in Phoenix landscape projects. Homeowners love the ambiance and connection to nature that these somewhat rustic fire features offer. It’s just so simple to walk out after a long day and enjoy the beauty and tranquility of a fire. 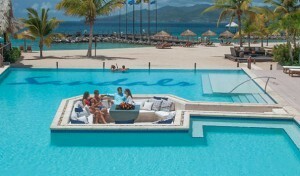 It’s a time to clear your mind and relax after a long and hectic day. 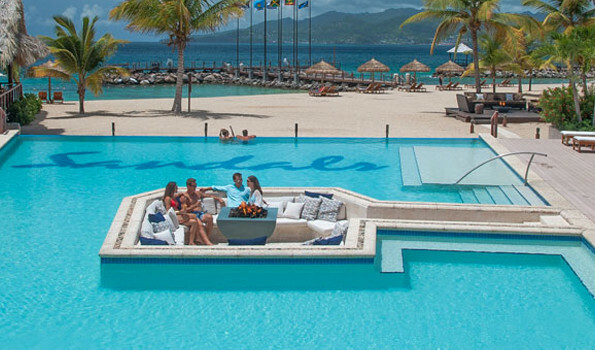 You can enhance your UNIQUE fire pit experience even more borrowing a few ideas from the fire pits found at some world class resorts.